In the quest for new spectrum to support the growth in mobile data traffic, some of the more commonly discussed possibilities include the release of spectrum from other services, exploitation of unlicensed bands, and moving to higher frequencies. Another interesting option is dynamic access to TV white space spectrum. The nature of terrestrial TV broadcast services is such that large portions of allocated spectrum are not used in all locations at all times. UHF TV services around the world generally occupy frequencies in the range 470MHz to 890MHz. Channels are allocated to geographical areas in such a way that adjacent areas use different frequencies and have relatively large guard bands between them, so as to avoid interference between transmissions. This results in substantial portions of spectrum being left unused in any given area. These are referred to as TV white spaces. The UHF TV band is particularly attractive for mobile communication, because it has useful propagation characteristics (e.g. it travels reasonable distances and passes through walls) and antennas can be small enough to fit on portable equipment. TV white spaces present the opportunity for a dynamic approach to spectrum access, whereby devices adapt their operating frequencies and power levels according to local spectrum occupancy. This can be achieved by using a system of databases, which record the active usage of spectrum in each area and calculate safe operating levels for white space devices. As devices have a need for spectrum they consult the databases for details of the frequencies and power levels they are permitted to use in their current locations. UK regulator Ofcom has been studying the opportunity for dynamic access to white space spectrum for some time. Its plans for UHF TV white space spectrum are already well advanced and it is considering applying similar principles to other frequency ranges in the future. In the UK the UHF TV band extends from 470MHz to 790MHz, structured as 40 blocks of 8MHz (referred to as channels, for historical reasons). The band is currently used for Digital Terrestrial TV (DTT) broadcasts and Programme Making and Special Events (PMSE), including the radio microphones used in studios, outside broadcasts, sports events, concerts, theatre productions and private functions. DTT spectrum allocations are relatively static and can remain largely unchanged for years at a time. In contrast, PMSE spectrum is allocated as and when required by activities in different locations. Short-term events, such as private functions, concerts and sports events, may require spectrum for as little as a few hours. Many of these events will be planned well in advance, but short term requirements may also crop up, for example if a major news story breaks. The chart below shows how spectrum might be allocated in a typical area at one point of time. The extensive white spaces illustrate the opportunity for dynamic spectrum allocation. There is a balancing act in implementing dynamic spectrum access. If access is controlled too tightly (e.g. power levels are set too low or guard bands are too wide) then the benefits of white space spectrum will be limited. However, if the level of control is too loose (e.g. spectrum usage information is out of date, power levels are set too high, or guard bands are too small) there is a danger of compromising important existing services. Ofcom has devised a framework of devices, databases and control algorithms to underpin the operation of TV white space dynamic access. The general approach is illustrated in the figure below. At the heart of the dynamic access framework Ofcom will operate a central control system, which will be supported by a number of independent database operators. The Ofcom system will take information on the usage of DTT channels in different parts of the UK and will apply a set of rules to derive white space operating parameters that protect TV broadcast services. This information will be updated every six months. The allocation of PMSE frequencies is already coordinated by a spectrum management company, JFMG, on behalf of Ofcom. JFMG will provide Ofcom with regular information on the allocation of PMSE frequencies, to enable Ofcom to provide those details to its independent database operators every three hours. 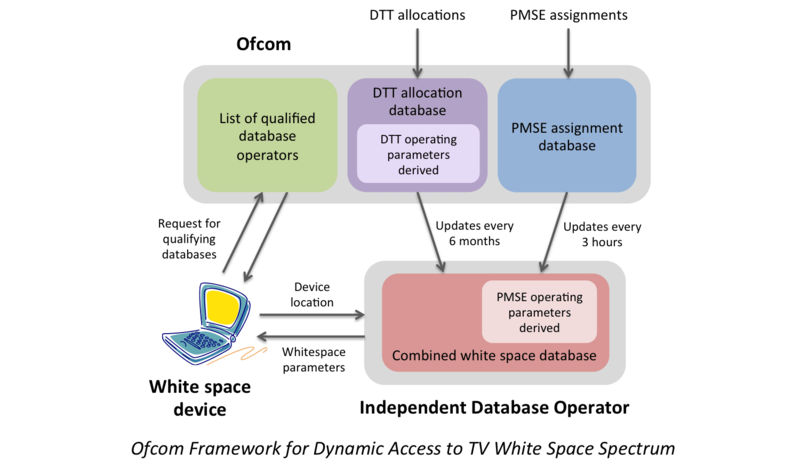 The database operators will apply algorithms defined by Ofcom to derive white space operating parameters that protect PMSE services and will combine this with the DTT white space information provided by Ofcom. When a white space device requires spectrum it first consults an Ofcom list of approved database operators. It reports its location to one of those databases, which checks the white space availability in the area and provides the device with operating frequencies and powers that are safe to use. Operating powers are set at low levels for white space frequencies that are close to local DTT or PMSE services, and at higher levels for frequencies that are more distant from local services. The white space parameters may be modified over a period of time, as local conditions change, and the system will be able to deliver ad hoc updates if required, to resolve any interference issues that might arise. The benefits of dynamic access to TV white spaces may be significant. For example, Ofcom’s modelling suggests that the best performing white space devices should be able to operate at maximum power in three or more 8MHz channels in around 90% of UK households. However, there are also challenges and concerns to overcome. Robust operation of the system will be essential, to avoid compromising existing services. Fundamental to its operation will be up-to-date information on spectrum usage, combined with operating parameters and algorithms that achieve efficient access to spectrum without creating damaging interference. 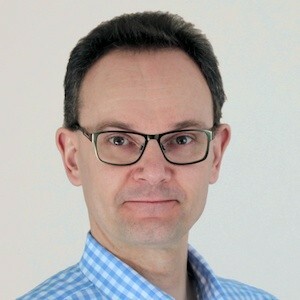 Existing users of the UHF TV band may be concerned about white space device users bypassing the control databases, for example if the system is slow or unreliable, which could result in uncontrolled access to the band. There might also be questions about the quality of service achieved by white space devices themselves. For example, someone living in Silverstone in the UK may use TV white space devices that work perfectly for 51 weeks a year, but each time the British Grand Prix comes into town their operating frequencies are knocked out by PMSE systems. Ofcom’s general approach is to start with white space allocation parameters that err on the side of caution, with the prospect of relaxing these over a period of time as the nature of dynamic allocation becomes better understood. Starting in October 2013, Ofcom plans to run three months of trials, to test the interactions between devices, independent databases and Ofcom’s own systems, and to gain a better understanding of dynamic access parameters and the potential for interference to DTT and PMSE services. In parallel with this, Ofcom is undertaking a consultation with interested parties from 4 September 2013 to 15 November 2013, to understand their hopes and fears for TV white space spectrum. The aim is to finalise a set of coexistence parameters in the summer of 2014, in preparation for a nationwide launch of TV white space access in the third quarter of 2014. This is an exciting new development in spectrum utilisation and it is good to see Ofcom forging ahead in this area. No doubt there will be challenges to overcome in its implementation, but I am sure this general approach will be an important element of future spectrum usage.